Blood pressure is a measure of the force of blood against your blood vessel walls. When your blood pressure is taken, two numbers are noted. The top number is the systolic reading. This measures the pressure when your heart pushes blood out. The bottom number is the diastolic reading, which measures the pressure when your heart is relaxed between beats and is not pumping any blood. If the blood pressure is high, it means that your heart is pumping the blood through your arteries very fast. This excessive force causes damage to the smooth lining of blood vessel walls, resulting in areas where fatty plaque (made of fat, cholesterol and other substances) can build up and make a bump. The bump gets bigger as more plaque sticks to it. The long-term effect of this is that the blood vessels collect a significant amount of fatty plaque, which diminishes or stops blood flow. This can occur anywhere in the body. In some people, the plaque bump will rupture and cause a traveling blood clot. The exact causes of hypertension are not known. Several factors increase the risk of having high blood pressure such as high salt intake, smoking, obesity, lack of physical activity, significant alcohol consumption, stress, age and, of course, genetics. A recent study showed that only half of Americans with hypertension have it under control. Carpenter Hearing can help you protect your hearing from further deterioration through education about what affects your hearing, as well as the proper use and care of hearing protection devices. 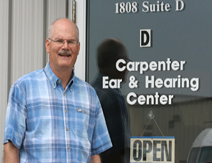 To learn more about Ear & Hearing health, please contact Carpenter Ear & Hearing in Green Bay. Please let them know that the Green Bay News Network sent you! Capenter Ear and Hearing Center’s goal is to provide you the best possible hearing care, based upon your individual needs. We provide a comprehensive array of services related to evaluation, rehabilitation and prevention of hearing loss.